Our Picture Gallery Identification Guide is an easy way to investigate the main fungus families and most commonly encountered fungi species. Alternatively, make use of our Top Twenty shortlists (below) and other Fungus Foray topics to help you get started quickly and safely. The kingdom of fungi is one of the most obvious but least understood of the many (at least six, and some scientists suggest almost twice that number) kingdoms of Life on Earth. The reasons are largely cultural: for centuries fungi were treated as the work of evil spirits, elves or witches; they were classed as 'excrescences of the earth - effectively mineral rather than animal or vegetable (the only two kingdoms of life accepted as such until recent times). Nowadays we know that fungi and neither animals nor vegetables, but they pre-date both in evolutionary terms; and when you begin taking an interest in fungi you soon discover just how fascinating they are. A fungus has no chlorophyll to convert the sun's energy into food; it has to rely on other plant and animal material, and it uses enzymes to dissolve its food. In many ways, fungi are more closely related to animals than to plants. Toadstools and mushrooms (there is no clear distinction between these two terms) may rot away after a few days, but they are just the fruiting bodies connected to long-lived underground fungal threads, called hyphae. The hyphae combine to form a mycelium, sometimes in the form of an expanding disc. Some types of mycelia can live for hundreds or even thousands of years. A 'fairy ring' consists of fungus fruiting bodies emerging around the edge of a mycelial disc that expands from its point of origin. The diameter of the fairy ring gives a rough guide to the age of the fungal organism (the underground mycelium, that is - not the mushrooms, which are merely its fruitbodies). At one time there was the norm to refer to edible cap-and-stem fungi as mushrooms and all poisonous, inedible or doubtful ones as toadstools. The trouble was, fungi were distrusted by nearly everyone, and very few of the edible and wholesome fungi were categorised as mushrooms. Also significant is the fact that most fungi are neither good to eat nor poisonous: they are simply inedible - in the same way that cardboard cannot really be classed as good to eat even when its manufacturing process is such that it contains nothing that is toxic to human beings. Given the remarkably rapid appearance of quite large fungus fruitbodies, which could emerge and change the landscape overnight following rain, it is understandable that fungi have long been treated with suspicion. The implication is that these 'toadstools' have something to do with darkness and evil. The term 'toadstool' has very little real significance today. Even the words 'Mushroom' and 'fungi' need to be qualified with edible, inedible, hallucinogenic or poisonous if you really want to ensure that the message is clear and unambiguous. > Scientific names > Common names > Mycological families or > Spore Print Colour (approximate). How many fungus species are there? The biological kingdom of fungi is enormous, containing at least a million species and perhaps ten times that number. Fewer than 100,000 species (17,000 in Britain) have so far been described scientifically and given binomial (Genus + species) names. Large fungi represent only a tiny part of the kingdom of fungi; the vast majority of species either do not produce visible fruitbodies or produce fruitbodies that are so small that they are rarely seen except by fungal scientists (mycologists). Although they do not look at all like the mushrooms that most people are familiar with, it is tiny fungi that cause the human infections referred to as ringworm and athlete's foot. How can I Identify Mushrooms and other Fungi with Confidence? No one can identify all of the fungi they find - even world-class experts struggle sometimes, either because a specimen is misleadingly 'non-typical' or immature or so old that key identifying features are not visible, or because they don't have enough specialist knowledge/information about that particular kind of fungus. Beginners should certainly specialise: start by concentrating on large, colourful, easily recognised and commonly occurring fungi such as those in the Cantharellus genus and the Amanita genus. There are some very distinctive mushrooms in various other groups too - for example several of the waxcaps ( mainly Hygrocybe species) and boletes (Boletus, Leccinum and Suillus species, for example) are fairly easy to identify in the field without microscopic examination. On the other hand, groups such as Cortinarius, Entoloma and Inocybe are fiendishly difficult and a high proportion of them require examination of cap, gill and stem features using a high-powered microscope combined, in some instances, with chemical tests. 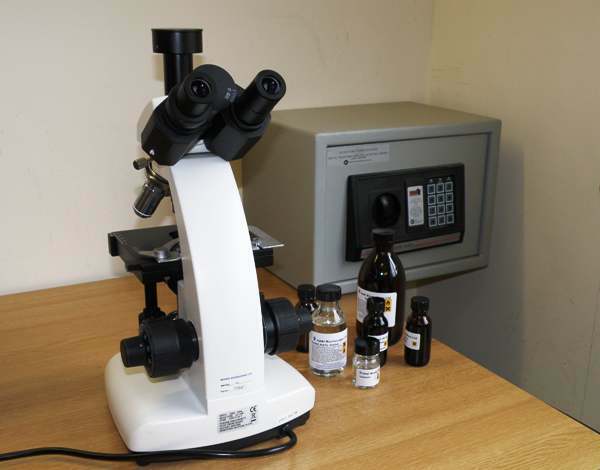 Microscopy is great fun, but it's not essential to own such expensive gear to enjoy finding and learning about fungi. There is also a drop-down menu via which you can get directly to picture galleries of the most popular 'types'. Do not try to identify mushrooms from appearance alone. Appearances vary greatly from sample to sample, and there are often lookalikes that can only be separated by assessing texture, smell, dimensions, shape of gills (if any) and so on. The descriptions are detailed because without the fine details identification is at best doubtful and at worst dangerous. For every species featured and illustrated in our Identification Guide pages you will find detailed descriptions, habitat and close-up pictures, and where necessary photomicrographs taken using a microscope and suitable chemicals to dye and make more prominent the key identifying features. But if your interest is in fungi for food, we have advice on what we call the 'Magnificent Seven' - wild woodland and grassland mushrooms that are easy to identify and great to eat - plus advice on a few of the deadly poisonous fungi that you really must learn to identify... and avoid! As you become more experienced you will want to use scientific 'keys', and generally these are published as specialist books for various groups (known as genera) of fungi. Some of the most useful specialist texts are listed on the various species pages. After using a key, it is still necessary to check the fine details, and if they do not match up then either the fungus you have found is not known to the author of the key or - and it happens a lot - you have made a mistake and need to rerun the keying process... or maybe you have found a fungus species that is new to science; that happens too! Everywhere there is water there are also fungi. Most fungi live on land, but a few live permanently in water. In grassland and woodland habitats fungi play key roles - without them most plants could not grow vigorously - indeed orchid seeds can germinate only when 'infected' by particular types of fungi. Not all fungus-plant interactions are mutually beneficial. Some fungi are parasites, feeding on, and in some instances killing their hosts. Foresters fear infection of their plantations by certain virulently parasitic fungi, such as Honey Fungus Armillaria mellea (above). Many more species act as waste recyclers, breaking down dead wood and leaves into simpler compounds that living plants can use as food. We now know that over 95% of plants live in symbiosis with fungi, via what are called mycorrhizal interactions. (The fungi link to and act as extensions of - in some instances actually invading the cells of - the fine rootlets of trees, orchids and most other plants.) The role of fungi as natural recyclers of dead plant and animal material is crucial to the survival of all other forms of life on Planet Earth. Apart from a few bacteria, fungi are the only thing that consumes the tough lignin material contained in dead wood. We derive many other benefits from fungi. Since the discovery of Penicillin (which was developed from a Penicillium fungus species) most other antibiotics come from fungi, at least originally. Now that superbugs such as MRSA (methicillin resistant Staphylococcus aureus) are becoming immune to our current range of antibiotics new medicines are required, and almost certainly they too will be derived from fungi. While some fungi cause crop diseases, others can be used in biological control of far more serious crop pests. Contaminated land is also being brought back into useful production by first introducing soil fungi, which break down toxins into simpler and less harmful chemicals. Some kinds of polypores have been used in dyeing of fabrics and for drying fishermen's artificial flies. The list of uses for fungi seems almost endless. Oh yes... and for aesthetic value (beauty) their form and colour diversity certainly rival flowers! The list of benefits we derive from fungi also goes on and on. One thing, however, could not go on without fungi, life on Earth would be impossible not just for us but for most other creatures with the possible exception of bacteria! The binomial system devised by Carolus (Carl) Linnaeus, is explained in our section covering the naming conventions and rules. Brief biographies of famous mycologists are a valuable addition, and Red Data List information from many countries as well as the implications of UK and EU legislation - Wildlife and Countryside Act; Countryside and Rights of Way Act (CROW Act); Habitats Directive; and explanations of site designations such as SSSI, Ramsar, SAC and SPA are also included. Our Search facility will take you to the relevant pages. Our identification guide has features of mushrooms, toadstools, puffballs, brackets and crust fungi in the - Class Basidiomycota (basidiomycetes) as well as cup and flask fungi from the Ascomycota (ascomycetes). In the gilled mushroom section learn about the Agaricaceae, which includes edible fungi such as Agaricus arvensis, the Horse Mushroom; Agaricus campestris (above), the Field Mushroom, and woodland species such as Agaricus sylvicola, Agaricus sylvaticus, and Agaricus augustus - the Prince. Supermarket mushrooms also belong here, and they include Agaricus bisporus, the well-known button mushroom, as well as Portabello Mushrooms and Chestnut Mushrooms, all variations on the same theme. Lepiota or dapperling mushrooms and Macrolepiota or parasol mushrooms, notably Macrolepiota procera, also belong in the Agaricaceae. Macrolepiota rhacodes is now known as Chlorophyllum rhacodes, having moved genus as also have other members of the same group. Lepiota cristata is an example of a dapperling; it used to be known as the stinking parasol. Various of the puffballs, Lycoperdon perlatum and relatives, including the Giant Puffball Calvatia gigantea, are now considered to be members of the Agaricaceae; they were formerly grouped with earthballs and stinkhorns in a mixed bag known as gasteromycetes or stomach fungi. Coprinus comatus, the Shaggy Inkcap, is now recognised as an Agaricaceae member, so most other inkcaps have been moved to the genera Coprinopsis and Coprinellus. We quote common synonyms. The Amanita fungi, which we categorise as the family Amanitaceae, are by some authorities included in the family Plutaceae, along with Pluteus and Volvariella species. Amanita caesarea (above) occurs in southern Europe and is a prized edible mushroom. Deadly poisonous amanitas include the Deathcap, Amanita phalloides; and Destroying Angel, Amanita virosa. Most famous is Amanita muscaria, the Fly Agaric - a hallucinogenic mushroom that must therefore be treated as poisonous. On the subject of toxins and hallucinogens, Psilocybe semilaceata, the Magic Mushroom, contains Psilobin and Psilocybin, which are hallucinogenic substances; so do many other gilled fungi. 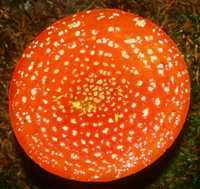 Grisettes are also Amanita species, the most common being Amanita fulva, Amanita crocea and Amanita vaginata. Other mushrooms in the group include False Deathcap, Amanita excelsa (synonym Amanita spissa), and Blusher, Amanita rubescens. Armillaria gallica (above), the so-called Humongous Fungus (read about it in Fascinated by Fungi, Pat O'Reilly's new book about fungi) and Armillaria mellea, the Honey Fungus, are just two of a complex of related species that are serious parasites and damage forests. These are members of the Physalacriaceae, but until recently they were included in the Tricholomatacea, a huge family that includes many white-spored fungi of various genera including Tricholoma, Tricholomopsis (the Plums and Custard mushroom is Tricholomopsis rutilans), Deceiver, Laccaria laccata, and Amethyst Deceiver, Laccaria amethystea. All the funnels, such as Clitocybe nebularis, Clitocybe geotropa and Clitocybe gibba belong in the Tricholomatacea, as do Lepista (Blewitts) and Mycena (bellcaps) and Flammulina velutipes or Velvet Shank. Calocybe (St George's Mushroom is Calocybe gambosa) and species from the genus Lyophyllum now belong to the family Lyophyllaceae, whereas they had been included in the Tricholomataceae for many years. Astraeus hygrometricus, the Barometer Earthstar is not a close relative of the other Geastrum species earthstars, which are grouped here with Phallus impudicus, Clathrus ruber, Clathrus archeri and other stinkhorns in a gasteromycetes group which has never had any taxonomic justification other than the convenience of grouping 'stomach fungi' together. Cyathus striatus and Crucibulum laeve are bird's-nest fungi in this group. Jelly fungi, another mixed bag within the Basidiomycota, include Auricularia auricula-judae, Jelly Ear Fungus, and Exidia, Calocera, Pseudohydnum and Tremella species. Boletales are interesting, and many are edible. Boletus edulis (above), known as Cep, Cépe, or Penny Bun Bolete (King Bolete in the USA, and Porcini in Italy) is most highly rated. Other boletes with pores include Suillelus satanas, Boletus badius, Suillus luteus, Suillus bovinus, Leccinum scabrum and Strobilomyces strobilaceus (synonym Strobilomyces floccopus). Some boletoid fungi have gills - Gomphidius roseus, Chroogomphus rutilus and Hygrophoropsis aurantiaca are examples. Paxillus species have recently been split up, too, and DNA sequencing has provided the evidence necessary for recategorisation. Paxillus involutus is the Brown Rollrim, now known to be deadly poisonous. Back with good edible species, we have Cantharellus cibaria and other Chanterelle mushrooms - Horn of Plenty, Craterellus cornucopioides, is one such; club fungi and some coral fungi are related - see Clavulina, Clavulinopsis and the Cauliflower Fungus Sparassis crispa. Hedgehog fungi, Hydnum repandum and Hydnum rufescens, also reside in the order Cantharellales. Certain other spined fungi belong in Boletales and Russulales, for example, so form is not a guaranteed guide to phylogeny. Wood-staining Chlorociboria aeruginascens, the Green Elfcup, is in form similar to many other cup fungi in the Ascomycota, such as Orange Peel Fungus, Aleuria aurantia, Scarlet Elfcup, Sarcoscypha coccinea and Sarcoscypha austriaca, and Bulgaria inquinans. Many other Peziza and pezizoid species are described with images, as are Morels, Morchella esculenta, Black Morels, Morchella elata, and the False Morel, Gyromitra esculenta - the latter is not edible - as well as Helvella saddle fungi, Dead Man's Fingers - Xylaria polymorpha - and the Candle-snuff Fungus, Xylaria hypoxylon. Daldinia concentrica, Cramp Balls or King Alfred's Cakes, also belongs to this group. Even a low-powered microscope reveals a lot about these kinds of fungi. Spore analysis needs a powerful microscope - mine is trinocular and I use it for taking spore and cystidia photographs. Grassland fungi include CHEG species - Clavaria, Hygrocybe, Entoloma and Geoglossum. Waxcap fungi, written wax cap in some books and waxy caps in the USA, are colourful, and the Pink Waxcap Porpolomopsis calyptriformis (above) and Parrot Waxcap Gliophorus psittacinus, are just two examples. Entoloma or pinkgill species are mainly dull and difficult to identify, but there are some blue mushrooms in this group including Entoloma serrulatum, which has black-edged gills. Geoglossum species are known as Earth Tongues. Most are rare and small - hard to see in grass. Some poisonous Entoloma species occus in woodlands as well as in grasslands. Polypores and crust fungi are many and varied. 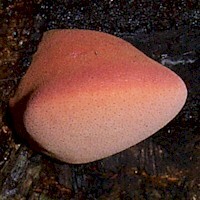 Fomes fomentarius, the Hoof Fungus, also known as Tinder Fungus, grows mainly on birch trees. Another birch-specific polypore is Piptoporus betulinus, also known as the Razor Strop Fungus. Other bracket fungi, or conks, include Ganoderma lucidum, Ganoderma applanatum, Inonotus dryadeus, Fistulina hepatica, Laetiporus sulphureus, Meripilus giganteus and Phaeolus schweinitzii. Crusts are as plentiful and include Stereum hirsutum and Stereum subtomentosum. Trametes versicolor, Turkeytail, is a pored bracket that grows in tiers, as do many more. In the webcap group, many toxic Cortinarius toadstools are described with pictures, including the deadly poisonous Cortinarius rubellus and Cortinarius orellanus. Gymnopilus junonius, Inocybe geophylla, and Galerina marginata are also poisonous. Deaths and serious poisonings including murders result from being fed fungi from this deadly bunch. Pisolithus arrhizus (above), the Dyeball, is ectomycorrhizal with many tree genera including Pinus species (pines). Russula fungi and Cortinarius, Tricholoma and Amanita all form mycorrhizas (some write mycorrhizae) with tree root systems. 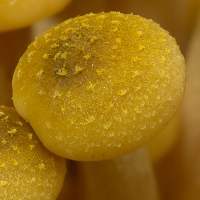 A mycorrhiza is a 'fungus root' - there areimages of mycorrizae on this website. Endomycorrhizas actually invade the roots; ectomycorrhizas surround the root and look like coral; see the book Fascinated by Fungi for photographs and much more information on this topic. Many of the fungi species pages include pictures supplied by generous contributors to who we are most grateful. It's not possible to mention them all, but you will see pictures provided by David Kelly, Simon Harding, Richard Shotbolt, David Harries, David Adamson, David Lawman, Steven Holden, Alistair Hutchinson, Tom Pearman, Tony Anderson, Hugh Purvis, Arnor Gullanger, Richard Haynes, Doug Collins, Nigel Kent, Penny Turner, Nathan Wilson, James Lindley, Stanislav Jirasek, Vaisey Bramley, Jochen Dahlke, Mike and Hilary Rose, Shane Templeton, Brian Broad and Bill Prince. We are also indebted to Angelos Papadimitriou for several corrections and valuable additions to the etymology included in these pages.